The canal bridge immediately to the east of the Galleon Bridge was at one time known as “Suicides Bridge.” This was on the footpath at the western end of the works leading to the Pancake Hills. We can only guess at why this bridge became a favourite for attempted suicide, but of the three canal bridges around Wolverton this had the least traffic and may have been the most private for those contemplating their end. One story that came out of 1915 concerned Mabel Timms, then 21 and living at 29 Green Lane. She was charged with attempted suicide, then a criminal offence. She had been going out with Charles Haynes of New Bradwell for about 3½ years. During the dinner hour on Monday December 17th he told her that he wanted to break off their engagement. She became extremely upset and, according to Haynes, she said she would not be going to work and he would never see her again. He told her not to be silly and to either go to work or go home. As she left him she went off in an agitated state down Church Street in the direction of Old Wolverton. That could have been the end of the story but a man called Leonard Rose of Newport Pagnell happened to be walking across the bridge a minute or so later. He was an insurance agent on his rounds. As he crossed the bridge he looked over the parapet see if ice was forming on the canal and instead saw a woman’s hat floating on the water. Immediately after he saw a woman’s head bob up above the water. She made no sound and he immediately struggled over the wall and hurried down the bank to the tow path. The woman came up again in the middle of the canal. Rose had been invalided out of the army with a gammy leg, and could not climb into the water. Instead, he grabbed a long ash stick and reached out to her. She flailed at it and it became entangled in her scarf so he was able to pull her to the side. She was unconscious, but he had learned artificial respiration while in the army and was able to bring her round. When she was strong enough he took her home. The court took a benign view of the case and adjourned the hearing for three months, and, subject to her good behaviour, would make a decision at that time. Leonard Rose was highly commended for his action. Following from the previous post, here is a plan in a little more detail for the land acquisition of 1864. This allowed for works expansion. There are two structures here which had to go, a barn close to the Stratford Road and a canal bridge. Both show on the 1835 OS map, so one assumes that the barn pre-dated the canal and the bridge was erected in 1800 to provide access to this barn and to the Old Wolverton Road. There are some clauses in the bill of sale that require the company to dismantle the bridge and build a new one at their own expense. The bridge was certainly dismantled, but I am not sure that a replacement was built. I haven’t looked into this, but there may possibly be some remaining evidence of the bridge supports along the towpath. I would be most interested if anyone can find them. The late 18th century witnessed a spate of canal building across the country and the creation of these waterways was an important first step in England’s industrial revolution. In 1790 some promoters planned a canal that would join the Oxford Canal at Braunston with the River Thames at Brentford. It was to be called the Grand Junction Canal – a name it bore until quite recently when it was changed to the Grand Union Canal. 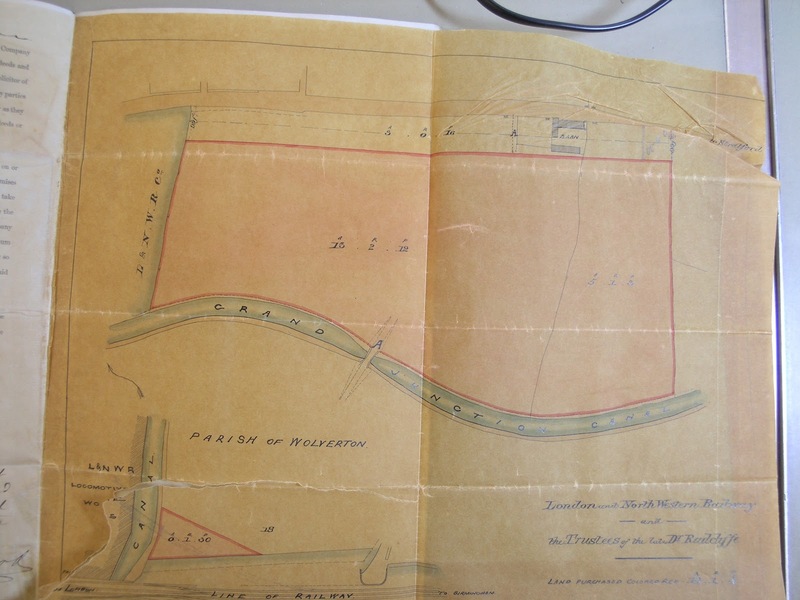 The proposed new canal would cut through the northern part of the Wolverton Estate and the Radcliffe Trustees met on 14th June 1792 to consider the imploications and came to a quick conclusion in support of the plan. It was the most momentous change to the landscape since the enclosures of the 16th century. They would not have considered the impact on the countryside since that was a concept unknown to 18th century people, but they did see the advantages of a canal to transport goods. The bisection of farms was a matter easily dealt with by the building of bridges. The canal was approved by Act of Parliament on 30th April 1793. Work began at both ends of the canal immediately but it was to be some years before the “navigators” came to the middle section in Wolverton. The greatest challenge at Wolverton was the passage across the River Ouse. 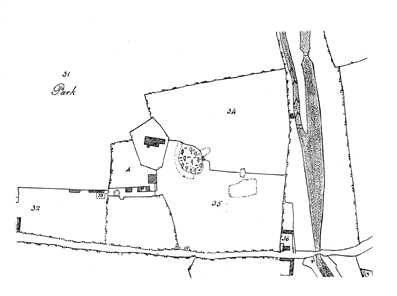 The original plan provided for four locks on the Southern bank and five locks on the Northern bank but in 1799 the engineer had second thoughts and proposed an aqueduct instead. However, because this project would add a further year of building they went ahead with temporary locks anyway. You can still find the remnants of these on the river bank. This 1804 map of Old Wolverton shows the lock channel as it once was. With these in place the canal opened for traffic in the autumn of 1800. Work started on the aqueduct two years later. The contractor, interestingly enough, was Thomas Harrison, the land agent for the Radcliffe Trust and resident of Wolverton House. It is doubtful that he had previous experience of engineering works on this scale but the Canal Company did award him the contract. The aqueduct was built with three arches to support a wooden trunk which was lined with clay to prevent leaks – which it did not. Boats began to use it in August 1805 but it seemed to be a perilous structure from the start. A few months later part of the embankment slipped. Repairs were effected but the Company Architect was not satisfied. Arguments about who was at fault went back and forth between Harrison and the Canal Company until February 1808 when the aqueduct spectacularly crashed overnight. Thomas Harrison still insisted that he was blameless and the fault lay with the men who had built the aqueduct. The Canal Company sued and took matters into their own hands. They built a temporary wooden trunk in April 1808 so that traffic could resume and commissioned a permanent structure. Stone piers were built and an iron trunk was ordered from the Ketley Iron Works in Shropshire to span the piers. This time they got it right, and in January 1811, the “Iron Trunk” was opened. Next month it will have been in continuous service for 200 years. Harrison was taken to court and found liable despite his protests and damages were set at £9,262 – a considerable sum of money in those days, but one, which Harrison was readily able to pay. The aqueduct was not without its consequences. The Ouse was always liable to flooding but in 1823 there was a great flood which even reached Wolverton House to a level of 17 inches above the floor. A civil engineer brought in some years later concluded that the aqueduct was partly to blame because it restricted the flow of water through the piers at high spate. It was not the only reason; the mill race was also a cause. Before the railways the canal operators more than recovered their investment, but they continued to be of importance in the commercial transport of goods. When I was a boy narrowboats, usually in pairs were still a regular feature, often carrying coal, but by 1960 commercial traffic was gone and leisure craft were increasingly using the waterways. There were quite important wharves at Old Stratford, by The Galleon at Wolverton and by the New Inn at New Bradwell. Gradually these ceased to function. The presence of the canal and its links to the sea made it possible for the enterprising Edward Hayes to establish his bat building business at Stony Stratford. See this post on Edward Hayes. In some ways the construction of the canal prepared Wolverton folk for the greater changes which were to come 40 years later with the railway line, and it was in part due to the presence of the canal that the London and Birmingham Railway Company decided to build their engine repair shop at Wolverton. 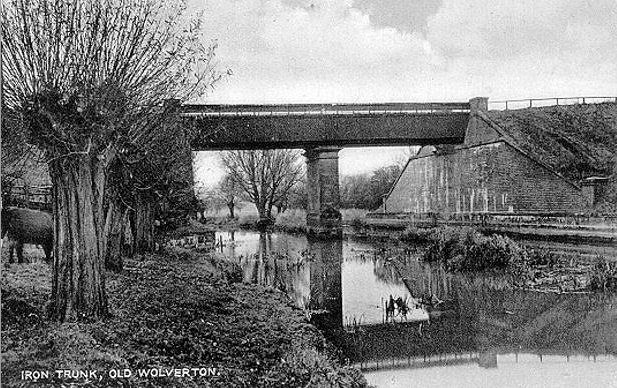 The first indication of the new industrial age in Wolverton was the construction of the Grand Junction Canal around 1800. The canal skirts the Ouse Valley at a contour of about 50 feet and crosses the river by this aqueduct between Old Wolverton and Cosgrove. This aqueduct was known as the Iron Trunk. In the 40s and early 50s working narrow boats were still a common feature of canal life. Usually the bargee and his wife would work two boats – the motor of the first towing the second. Coal was the main commodity transported by this method. Sometimes they had small children on the boat. Gliding through the country at a leisurely pace must have brought its own rewards, as I suspect they were probably paid very little for this work and lived only a little above the poverty line. A story told about my great grandfather William Webster, who kept the Red Lion in Leighton Buzzard, may illustrate this. In one of the years in the 1890s there was a serious deep freeze one winter and all the narrow boats were trapped in the ice at Linslade. After a few days they were out of food and would have no money until they completed their delivery, so Webster organised the community to donate food and organized a soup kitchen for the canal folk outside the Red Lion. The Iron Trunk had a tow path on one side. The drop to the river below was 40 or 50 feet. Some more daring boys would walk along the girder on the west side and I never heard of anyone falling. By the 1960s, when this photo was taken, working narrow boats had gone and were being recycled as pleasure craft, like this one.